Oh man... my boy and his love of water... We went to K-State, because I had left my glasses at work, and spent some time at the K-State Gardens and the Insect Zoo - Arrow was closed for private graduation functions, so we had to do something to appease Jimmy. Mild disappointment aside, we had a wonderful time at the Gardens and Insect Zoo and the weather was perfect: warm without being hot, cool without Jimmy getting cold even though his top was wet from fountain water by the time we wanted to head home. 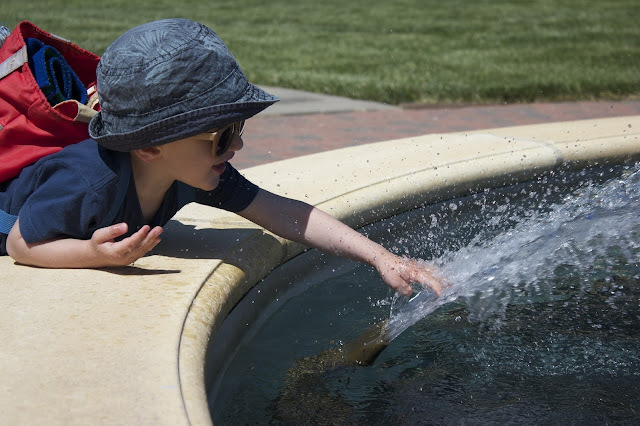 Michael took this photo of Jimmy at the fountain right outside the Insect Zoo. It's such an elegantly simple fountain, it's my favourite one around here.